Action round-up to Sat 12th Jan: of trees, diggers and digging. 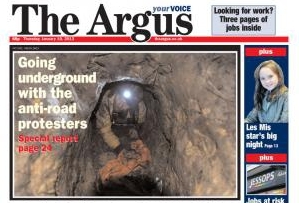 All week tree defenders have been climbing, tunnelling, digger-diving and outsmarting gangs of contractors and security who have been attempting to clear the Combe Haven valley of those trees standing in the way of the planned Bexhill-Hastings Link road. 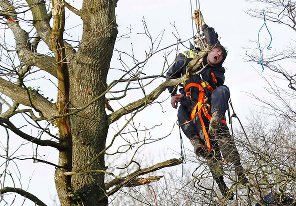 The action kicked off on Monday 7th when the chainsaws fired up for the new year and went for the trees near Upper Wilting Farm. 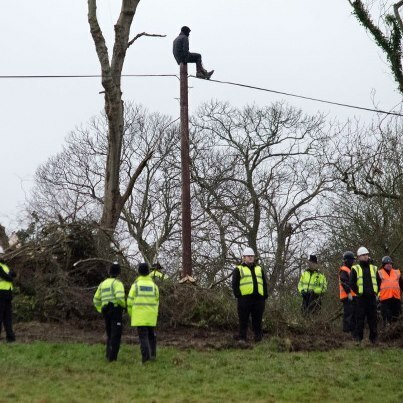 The contractors, accompanied by massed ranks of security, haris fencing and a significant police presence were met with an early morning resistance from defenders who scrambled up trees, tusselled with security and obstructed the movements of an excavator with a sit down protest. 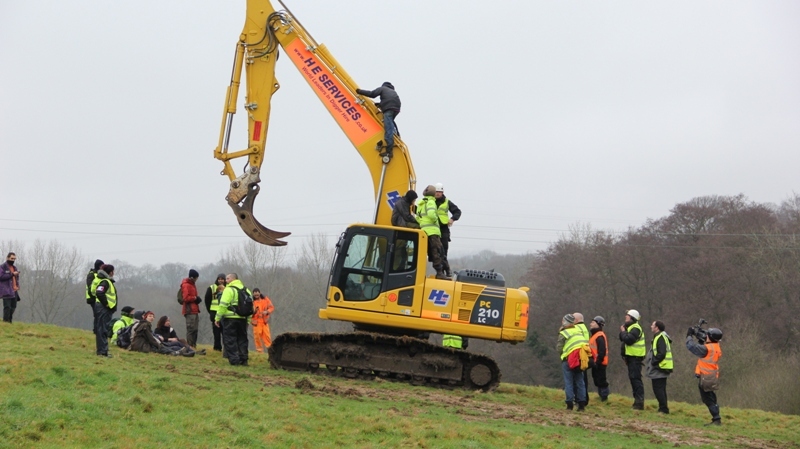 Other activists clambered atop the monstrous arm of the ‘HE services’ digger and further halted works – the very first digger-diving of the campaign! Security continued to be heavy handed and in one case pushed an elderly local to the ground, resulting in her having to go and see a doctor about resultant headaches and neck pains and ‘concern’ from the police liason officers (who of course refrained from stepping in to prevent the assault in the first place). By the end of the day two arrests had been made. 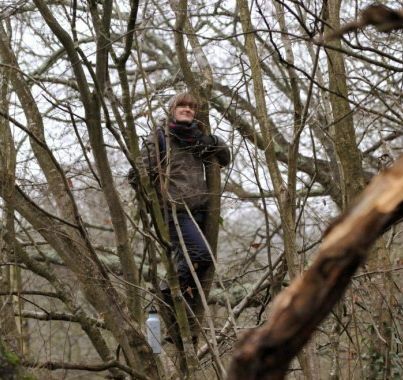 Tuesday saw another early start, though for one pair of intrepid defenders who had set up an impromptu tree sit high in the remaining trees lining the Crowhurst road – scene of the previous days felling – there was no need to roll out of bed to get to the action. Security climbers who had been hanging about since Monday were called in and slowly made their way up to the committed duo. A risky and aggressive eviction took place with the climbing team attempting to lower one defender down in an improperly secured safety harness! It was only through calls from comrades on the ground that alerted them to the situation. Both defenders were eventually lowered to the ground, arrested and – bizarrely – charged with assault! Later in the day a quick-thinking defender scaled this time not a tree but a telegraph pole on the other side of the road to where the chainsaws were felling. Work had to stop because of the potential danger and this time security climbers found it impossible to evict the defender, unable as they were to find a higher point to secure on to. Instead, a bunch of coppers closed off the road (which was unecessary, and no doubt intended to hack off the locals) and stood about ready to nick the pole-sitter when he came down. Holding out until the contractors had beaten a retreat a valiant attempt was made by supporters to “de-arrest” the defender upon his descent, but were met with the full force of sussex police, who piled out of a nearby riot van screaming “pepper spray them, pepper spray them all”, and duly dispensed their canisters. In the ruckus the pole-sitter cut open his leg and, after being nicked, was taken to hospital for 8 stiches. He was released in the early hours and, just as in the previous arrests, bailed off site. He was charged with obstruction of the public highway (that is, the same public highway that the police themselves closed…?!). Wednesday and Thursday saw a tactical regrouping and the shoring up of defences, although one person was arrested Wednesday morning in dubious and unclear circumstances. A fully fledged third camp had by now formed based around three massive oaks that lie in the path of the road adjacent to the railway line. By sundown on Thursday a huge fishing net donated by the good fisherfolk of Hastings had been strung between two of them, with walkways – and a suspended platform that security climbers eyed with caution – all rigged high in the branches. Local people continued in their support by bringing food and water, good cheer and mucking in with tunnel digging and tree-housing building. National media had by now started to take an interest and the camps welcomed smartly dressed journos down from London and elsewhere who, so far, have been largely supportive of the campaign. 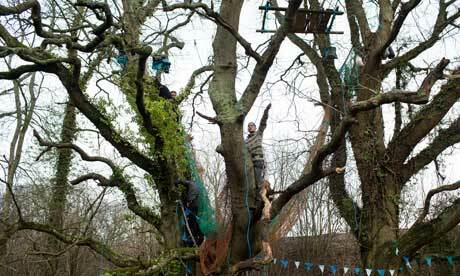 The chainsaws continued to ‘tidy up’ their work at Upper Wilting Farm and defenders stayed vigilant. Come friday there were few areas outside of the 3 camps that the chainsaws could access to fell trees and subsequently knocked off early. Security climbers, police and contractors have continued to sniff around the camps and a helicopter circled above the Adams farm camp on thursday taking photos. Help is needed at the camps to protect the remaining trees and hold-up work, which will likely start up again on Monday 14th. Sources suggest that if we can delay the felling for a month then contractors will have to wait another year before being able to cut down more trees due to environmental constraints and the forthcoming nesting season. Come down, bring friends, family and support. There is plenty to do in both arrestable and non-arrestable roles. Save the valley, stop the road!